We have been living under a pretty big cloud of secrecy when it comes to Star Wars: The Last Jedi. Even the first teaser trailer raised quite a few questions about the movie and didn't give us too many answers. But Disney and Lucasfilm have pulled back the veil a bit and given us a look at some of what we are going to see in Star Wars 8. 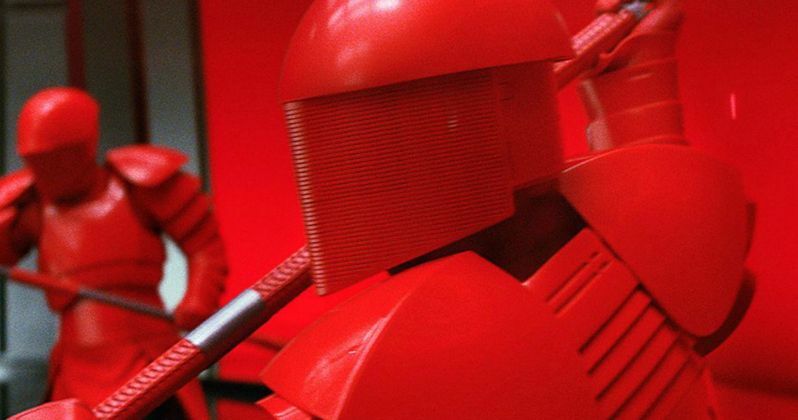 For one, we have just been given our first official look at Supreme Leader Snoke's Praetorian Guard's, as well as a bunch of new info on Snoke's role in the movie. This comes to us from Entertainment Weekly as part of their massive cover story on Star Wars: The Last Jedi, which is set to arrive in theaters on December 15. We had heard previously that Snoke is going to have some royal guards, similar to Palpatine in Star Wars: Return of the Jedi, but there is going to be a major difference. According to writer/director Rian Johnson, these Praetorian Guards are actually going to look like they're ready to do battle. Based on the image, that looks to be correct. Here's what Rian Johnson had to say about the guards. "The Emperor's guards were very formal, and you always got the sense that they could fight, but they didn't. They looked like they were more ceremonial, and you never really saw them in action. The Praetorians, my brief to [costume designer] Michael Kaplan was that those guys have to be more like samurai. They have to be built to move, and you have to believe that they could step forward and engage if they have to. They have to seem dangerous. They're his personal guards. They stick with [Snoke]. So they're essentially bodyguards." The guards certainly look reminiscent of the Imperial Guards, but they are much more sleek and practical. According to the report, the Praetorians get their name from the elite special guards who protected ancient Roman emperors. As Rian Johnson says, "If we can get kids' ears to perk up in history class a little bit when they hear that, that'd be a cool thing." Johnson also talked a bit about how Supreme Leader Snoke is going to factor into the story of Star Wars: The Last Jedi. We're going to see plenty of him, and not as a hologram this time, but just don't expect to have the entire mystery of the evil being revealed. "Similar to Rey's parentage, Snoke is here to serve a function in the story. And a story is not a Wikipedia page. For example, in the original trilogy, we didn't know anything about the Emperor except what Luke knew about him, that he's the evil guy behind Vader. Then in the prequels, you knew everything about Palpatine because his rise to power was the story. we'll learn exactly as much about Snoke as we need to." There have been countless fan theories about Snoke ever since he appeared in Star Wars: The Force Awakens, but it doesn't sound like any of these theories will be confirmed or denied in the upcoming sequel. But Rian Johnson says, "We will see more of him, and Andy Serkis will get to do much more in this film than he did in the last one," while also saying that Andy Serkis is a "Force of Nature." Anyone familiar with the actor's work probably won't find that too surprising. "I'd be sitting at the monitor just with my eyes as big as dinner plates. It's one of those performances where after every line, I'd look over at whoever's standing next to me with an expression on my face like, 'Oh, my God, we just got that." There were some rumors that suggested we will be seeing a giant, practical puppet version of Snoke in Star Wars: The Last Jedi. Rian Johnson has put that rumor to bed, confirming that Snoke will be a pure CGI creation based on the motion capture performance provided by Andy Serkis. But there was a model built for actors to use as reference on set, which is likely what we saw in the behind-the-scenes sizzle reel that many thought was Snoke. "No, it's entirely a mo-cap performance, [Creature designer] Neal Scanlan built a maquette that we had on set for lighting reference and to give the actors a sense of what it was going to feel like. And then we scanned that and [Industrial Light & Magic] used that in their renderings, but Snoke will be an entirely CG creation." The good news is, we are going to get a lot more of real Snoke in Star Wars: The Last Jedi and some flashy guards. It just may bum some fans out to know that we aren't going to do a deep dive into the character's history. Be sure to check out the first official photo of the Praetorian Guard's for yourself below.